Pour over coffee is fast becoming one of the most popular ways for coffee enthusiasts to enjoy coffee, particularly at home. It is considered as "craft" coffee because it really allows the maker to experiment with, and calibrate, their coffee to achieve the perfect extraction. It is part art and part science, but the three minutes spent are very rewarding to those that appreciate really good coffee. You can get started with a basic, but very nice, equipment package for less than $100. The equipment package below, from Amazon, is (except for the grinder) the same as my set-up at home, and is perfectly adequate to make excellent pour over coffee. You may already own a digital scale or digital timer (or can use the one on your smartphone) which would reduce your outlay even more. We did not include a pour-over stand, which is optional, but not required. Lastly, and most importantly, you will need some decent quality whole bean coffee. Now that you have an overview of the equipment that is entailed, we will guide you through the essentials of making pour-over coffee, show you various options for equipment choices, highlight product reviews from Amazon that we think are helpful and provide links to a handful of products in each category. The highlighted green boxes are those items that we manufacture, have used, or find to be of good value. We hope this format enables you to get a rapid exposure to everything you need in one place. There are many videos on YouTube explaining how to brew pour over coffee - we picked this 3-minute video from YouTube to give you a nice introduction to what's involved in making a good cup of pour-over coffee. Depending on your preference for precision over expediency, much of the precision measuring and timing can be simplified after you have done this a few times. The cone shape popularized by the Hario v60 is a cylindrical cone shape with a large single opening at the bottom. The large hole requires more attention to all the variables (grind size, coffee portion and pour technique) in order to achieve a controlled flow through the dripper that is not under-extracted. This is a very popular style dripper used in coffee shops. The flat bottom dripper, popularized by Kalita, has a flat bottom with a few small holes to allow the coffee to pass through. This style provides a more restricted flow and is a bit less reliant on user technique to achieve good flavor extraction, but still allows for detailed calibration if desired, so very flexible in that regard. Kalita has a uniquely designed wave filter for flat bottom drippers which creates a barrier between the coffee and the dripper. Full disclosure: our Kalibrera dripper is in this flat bottom category. The V-shape dripper popularized by Melitta, generally has 1-4 small holes at the bottom of the V for the coffee to pass through. This style is generally cheaper and it seems to be mostly used in the home but not really by baristas. Most supermarkets carry this style of filter (whereas the other two filter styles are generally sourced online or in specialty stores). Most of the debate among baristas is about the preference between the cone shape Hario and the flat bottom Kalita. Some drippers are available in plastic and the Kalita has a stainless steel version. We recommend ceramic as a first choice. The stainless is also good, but we definitely would shy away from plastic versions. On Hario v60 versus Kalita - "I have the Hario V60, and I always found that it was inconsistent in producing good coffee. The biggest advantage of the Kalita is that it's much easier to get consistent results. This is due to the fact that the Hario has a giant hole on the bottom, so you really need to be careful about pouring slowly and evenly. The Kalita has 3 small holes on the bottom, so even if your pouring is a bit too fast, the dripper will compensate for it to some extent." Once you select a particular style of dripper you should absolutely try to use the correct type of filter for that dripper style. That means you will either select a cone shape, flat bottom, or V-shaped filter. Beyond that, you need to decide whether to use the brown unbleached paper filters or the white bleached filters. The trade-off here is that the unbleached filters may impart a slight paper taste to your coffee, while the bleached filters have a chemical smell and may impart some of that flavor. Many people recommend pre-wetting your filters before brewing, so if you are going to do that, then it probably doesn't matter which type you use. Next, some filters are made of a heavier duty paper than others; stay away from the very thin filters. Lastly, for V-shaped drippers you will have a choice between #2 and #4 size filters, #4 being larger - we say just buy the #4 and fold it over the edge of the dripper - the #2 in our opinion is a bit difficult to work with. On white bleached filters - "Take these filters out of their package and let them breathe for a few days before use--otherwise your coffee might taste like plastic when you brew with them, even with thorough pre-rinsing. That said, once the 'breathing' period is over, you don't need to pre-rinse at all--white Kalita filters are made with paper clean enough to not need it." On using the right filters - "I had been using the cheap Target brand filters and they just didn't fit my Kalita well, and occasionally I would get sloppy with the pourover and the filter would flop and the grounds would go in my drink.... it's just such a nicer experience using the wave filters. It really is. I wasn't sure it would make a difference--and perhaps it is just an aesthetic difference--but my morning seems so much more put together using a filter that FITS. I'm not a coffee snob, I just like the elegance of the whole pourover system and how little there is to clean, compared to using my french press when I'm just making coffee for myself." What will you brew into? There are essentially two choices for the type of vessel you can brew into. You can brew directly into the cup, or you can brew into a coffee pot or carafe. If you normally make just one cup and like to brew directly into the cup, it will be difficult to gauge how full your cup is when pouring, so either, use the scale or consider a pour over stand so that there is some vertical distance between the bottom of the dripper and your cup. If you will be making more than one cup, then we recommend using a glass carafe. 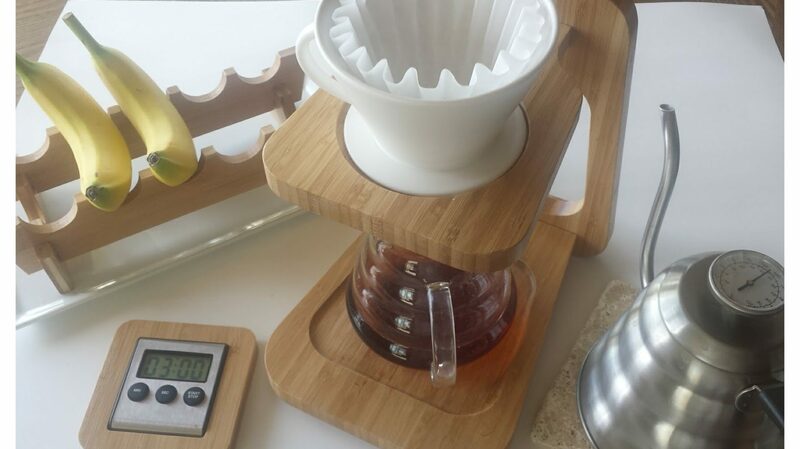 You can mount the dripper directly on top of the carafe, or you can use the carafe and a pour-over stand. A capacity of 600ml is enough for two cups; if you need more, go with perhaps an 800ml carafe. 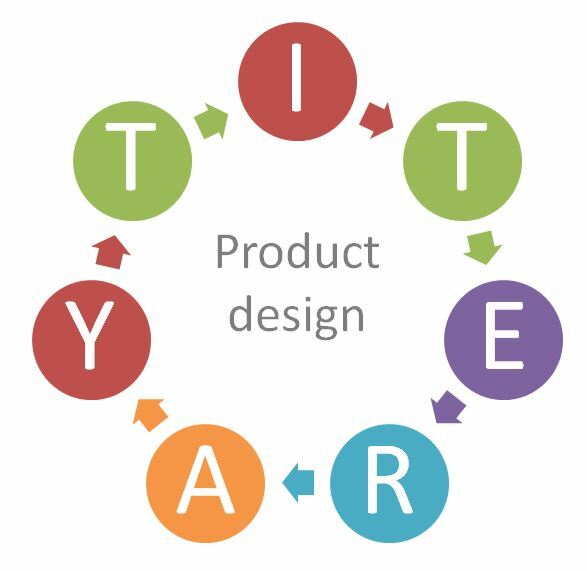 The choice of carafe will not affect the quality of your coffee, so it's mostly a matter of personal preference for the design and the capacity. 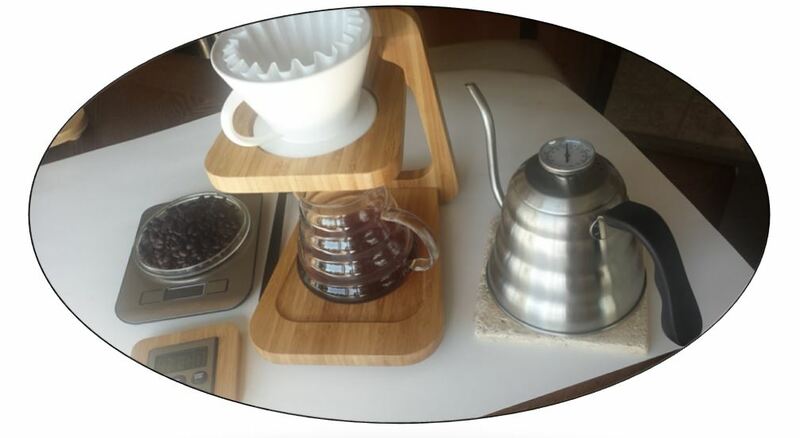 On the Hiware 600ml - "Perfect accessory for a V60 and saves you a few dollars at the same time! Made of Borosilicate so it is temperature stable. Thin glass, so you need to handle carefully as you might with fine wine glasses. Enough volume to make 2 standard size coffee mugs of coffee. I haven't tried the Hario branded server of similar size. But this one works great and costs much less, so I'm a happy coffee drinker"
Most of these are very thin glass, so be careful when using - "I bought the Hiware as it was a less expensive option and even though it was less expensive it seems like very good quality. It does feel fragile but I have used it every single day for coffee and so far no complaints"
While it is possible to make pour-over coffee with a regular kettle, the idea behind using a thin spout gooseneck kettle is that it allows for much greater control of the pour rate which is important with pour over coffee. That being said, the type of gooseneck kettle that you use will not change the quality of the coffee. There are electric gooseneck kettles or non-electric kettles that you can heat on the stove (this is what we use) and many of them have a thermometer embedded in the lid which is a nice feature. Most of the kettles have a capacity of 1 to 1.2 liters, which is enough for a full pot of coffee and you are not wasting energy heating up extra water unnecessarily. Lastly, we recommend a stainless steel kettle, which most are. Most of the review comments from Amazon are applicable to any gooseneck kettle so we'll share those and recommend the one we bought which was the cheapest stainless steel one with a thermometer for under $10. I don't expect it to last forever, but I am very satisfied with the value for $10! "I expected a larger kettle when this arrived, turns out it’s the perfect size for making my pour over coffee every day. The built-in thermometer works great. Pay attention to the temperature, if it boils too long, water will start to spit out of the spout." "One other small issue: that thermometer is held with a nut and bolt and that nut keeps coming loose - I have to constantly tighten it. No big deal, but it shouldn't be a problem and it is." "It is well-constructed, and the handle design keeps it cool to the touch- no need for a hot pad to pick it up." A scale - necessary or overkill? If you are just getting started with pour over you may be thinking that a scale is overkill, and is not really necessary. It is actually necessary at first, but you will be able to get by without it once you have familiarized yourself with your equipment; for example, if you know one cup of beans is 30oz, there is no need to use the scale anymore if that is your desired weight. The good thing about these digital scales is that they are very cheap - in the $10 range - and can be used for other cooking activities in the kitchen and even for weighing items for postage, so don't neglect this one. Obviously, if you already have a kitchen scale, then there is no need to buy another one. There are many nice, small, stainless steel facing digital scales and many of them look like they come from the same manufacturer, but have different brand names- when I see that, I instinctively buy the cheapest one. I suggest you buy the one whose design appeals most to you - they all function pretty much the same. "I bought this scale to weigh food for calorie control. It's perfect and worth the price. The tare function is very useful and I don't need to do any math." "It's also easy to choose which readout you want. You can select pounds, ounces, kilos, grams, and milliliters and will show down to 1/100th of an ounce! Much smaller than I usually need to measure. It will measure up to 11 pounds which is more than enough for around our kitchen and home office. We will also be using this for occasional mail metering, but most of the time it will be helping us to keep us in line with recipes. The stainless finish on this makes it easy to clean off and the slim, compact design makes it really easy to tuck away." "They even made the battery compartment easy to get in and out of plus they provided a pair of batteries, which most companies won't bother to do these days." Being able to grind your coffee beans freshly as you are about to brew coffee is essential to get the best flavor out of your beans, so owning a grinder is a must. I used to own a coffee shop and have a few of those nice commercial grinders at home, so I have not bought any of the grinders displayed below, but they are reasonably priced to get started. In fact, the manual hand-held grinders allow you to insert exactly the amount of beans you need, so there are no excess grinds going stale like I end up with on my commercial grinder. Some manual burr grinders are stainless steel and some are glass. Since there are a lot of moving parts and workmanship is an issue, I would choose one that is popular and well reviewed. I personally like the Bassani with the glass vestibule that lets you see the ground coffee better and it is well reviewed. On the Bassani - "Prior to buying this grinder I was using an electric stainless steel blade grinder, which only took seconds to grind my coffee, but the results were nowhere near the quality of the grinds that ceramic burrs provide. The grinder works perfectly, the size is great, easy to grip while grinding and it has all the bells and whistles you need like the completely closed lid to avoid beans flying around, the catcher, measuring aid, etc. The quality is impressively good, although I have used it only two weeks it seems pretty durable and the design is pretty nice as well." Basically, you need a standard digital kitchen timer to time your water pour which lasts about 3 minutes. If you don't want to buy one, use the timer on your smartphone. Get something with a nice big display and buttons that are easy to push. I like the timers with the stainless steel finish, but they are about twice the price of the plastic timers. 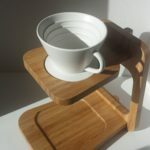 We have a nice wall mount bamboo framed holder for the stainless timer that matches our bamboo pour-over stand (pics below), but we have not yet done a production run on them yet, so perhaps they will be available later this year. Prior to that, I had picked up a digital timer similar to the Table King timer below at Dollar Tree for $1 and it works fine. It uses the cell batteries, so if the battery dies I will just throw it away. If you are going to spend more than $5 make sure it uses regular AAA batteries, not the cell batteries. 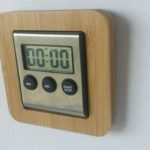 Most timers have both a retractable stand and a magnet at the back, so you can attach to the fridge, place on the counter, or just use in your hand. We will show a range of options below; just choose one that you like. Even the cheapest 2 for $8 timers get good reviews - "Perfect for my physical therapy office. Numbers are large. Time can be set one sec or minute at a time or speed up by holding long press. Volume toggle for very loud or just loud. Magnets on back to stick against something it sturdy stand to use on table top. Once time runs out, pressing stop will reset the clock. Can press 2 buttons together to clear screen. Uses one AAA battery so much more convenient then button cells." In conclusion, the dripper, filters and grinder are the only ones that will impact the quality of your coffee, so spend a little more on these. For the other items, you don't have to overspend unless you really like a particular design.